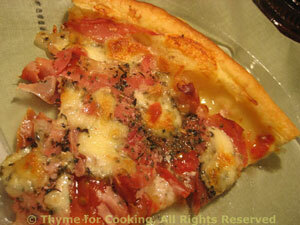 Puff Pastry and Prosciutto Pizza, Thyme for Cooking easy gourmet pizza. Use regular 'pizza' mozzarella for this, as the fresh balls have too much moisture in them and make a soggy crust. The puff pastry makes a light and flaky crust and the pizza is ready in no time! Lay the pastry crust out on a baking sheet. Slice tomatoes as thinly as possible, 8 - 10 slices per tomato. Tear Prosciutto into small pieces. Arrange the tomato slices on the pastry. Lay the Prosciutto on top. Sprinkle with herbs, then cheese. Bake in a preheated oven, 400F (200C) for 20 - 25 minutes, or until crust and top are golden brown.